To everyone who attended the 2013 Esri User Conference, I want to thank you for helping to make this year’s User Conference such a great success. For those who could not attend, let me take a few minutes to give you an overview of my opening remarks on Monday morning. The theme of this year’s User Conference was “GIS: Transforming Our World.” When I first started looking into this magical word transformation, I found something really profound. It basically means change. Changing in two ways–physical change as well as the perception of what we see. And GIS has a lot of relevance to both of these kinds of change. Your work as GIS professionals is physically changing the world through all kinds of activities. But it’s also changing how we see things, and how we communicate them, which is driving changes in the way we understand and interact with our world. 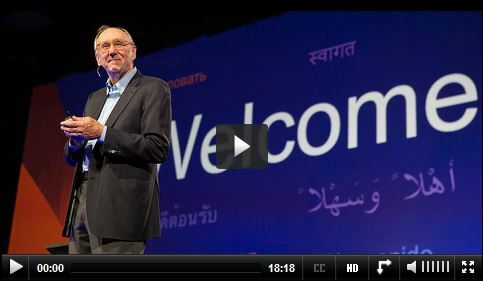 Watch Esri president and founder Jack Dangermond deliver his opening remarks at the 2013 Esri International User Conference. Today our world is facing serious challenges, and it’s clear that we need to work together to collectively create a better future. We don’t really have a lot of choice in this matter. We need to leverage our very best brains, our best creative talent, our best design talent, our technology, and our science, and use it to create a more sustainable future. It’s a big challenge–by its very nature, a geographic challenge–that will require a lot of GIS talent. GIS changes how we think and how we act. It’s transformational. It also integrates geographic science into everything we do–what we measure, how we analyze things, what predictions we make, how we plan, how we design, how we evaluate, and ultimately how we manage it over time. GIS is already helping us to understand things. It provides a framework for transforming the world through all kinds of activities. But to meet the geographic challenges we face, we need to also fundamentally transform GIS itself. We need to scale up GIS. GIS is integrative; it’s visual; it’s quantitative, and it’s analytic. It has the power to organize things systematically. And it’s built on the science of geography, which is comprehensive and cuts across many disciplines. The scientific foundation of geography is the basis for the scaling up of GIS to meet the grand challenges the world faces today. By scaling up, I mean that we need to grow GIS beyond the projects and systems we’ve become so accustomed to. We need to embrace GIS inside of organizations and make it pervasive throughout organizations and across society. It’s a nice vision. But is this really possible? I’ll simply offer to you an example of another technology that has already done this: GPS. GPS is everywhere–it’s in our cars, and it’s in our phones. GPS technology has totally transformed us as human beings so that we’re never lost. At its core, GPS has profoundly changed the way we interact with the world. If we could make GIS technology as pervasive as GPS, our organizations would never be lost, our communities would never be lost, and our society would never be lost; negative trends could be reversed, and we could actually envision and create a more sustainable future. This is a powerful notion. It’s truly transformational. And I think GIS professionals are up to the challenge. 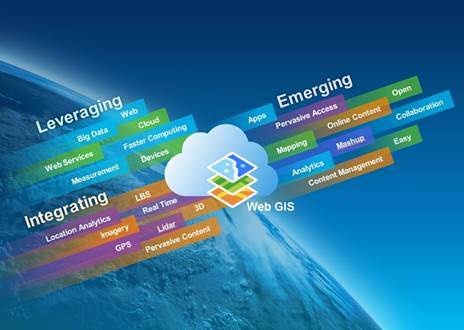 This vision is being driven by the transformation of GIS into web GIS. 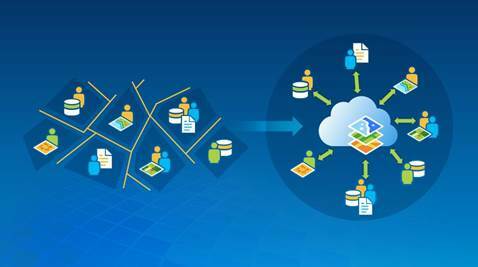 This evolution means that GIS can fully leverage and take advantage of the web and the cloud, big data, faster machines, and other big technology trends. GIS is also advancing by integrating all of the new measurement types–remote sensing, GPS, the sensor web, citizen science, crowdsourcing, and pervasive information –and it’s all very visual because it’s in 3D. What is emerging is a new pattern: a pattern of apps that make cool maps, do analytics, allow pervasive access to your work, support better content management, and increase collaboration. It means that GIS is getting easier to use. It’s getting dramatically more accessible. And it’s becoming much more social. It means that the evolution of GIS into web GIS transforms the technology from a valuable tool for projects into an essential tool for society. GIS in a web environment, or web GIS, can of course represent all of the typical data types–maps, imagery, and different kinds of services. But it’s increasingly able to bring in new kinds of data–tabular data, enterprise data, spreadsheet data, big SAP databases, etc. It can also integrate social media and sensor networks, real-time information, and more recently, the whole world of big data, providing a new medium for understanding. Web GIS also provides a new pattern for integration. Traditionally, GIS was all about the geodatabase; we very carefully integrated all of our data into the geodatabase. That’s really important work, and most of you have done that kind of work. But web GIS represents a fundamentally different pattern. It means that we can integrate things dynamically from distributed services, using web services and web maps. And this enables a more flexible and more agile approach. new relationships, sharing resources, and supporting collaborative approaches. Another intriguing aspect of web GIS is that it breaks down the fundamental barriers that separate organizations. Whether the silos are departmental or organizational, the ability of the web GIS environment to fluidly integrate different disciplines and different activities gives us a new framework for collaboration. Web GIS has one other interesting ingredient: it can help us organize our work. It provides content management capabilities for all of your maps, apps, and models, and also it simplifies the sharing these within a group or across departments and organizations. Web GIS is a very attractive framework that can help us to scale up our work, our knowledge, and our understanding. From what I am seeing today out there in the GIS community, web GIS has already started to fundamentally transform how people and organizations work. And who’s leading this transformation? You understand the technology. You are embracing these patterns. You are sharing your work and your knowledge. You are driving this transformation of the way we work, and in the process you are transforming our understanding of the world around us. When you put all of this together, you begin to realize that we suddenly have a totally different kind of GIS. But this isn’t just a more simplified approach to mapping–it’s a change in how we leverage geographic information. This change isn’t happening from some outside influence–it’s being driven from within organizations like yours. Because of this, GIS professionals are essential to making this happen. In my mind, there has never been a more exciting time to be a GIS professional. Thank you again for making the 2013 User Conference an amazing experience. As Esri continues to grow and evolve, you constantly remind us to stay focused on what is important: our mission of advancing GIS and supporting our users. Your efforts are having a large impact on our world. Thank you for letting us help you to make a difference.